GIMP 2.9.6 (GNU Image Manipulation Program) the most recent release, is a free cross-platform image editor that runs on various OSes which includes Linux, OS X, Windows etc. With GIMP, you can open and save images to most file formats and it offers many other useful features, plus the scope to add more using its plug-in system. Make it possible to use multithreading in GEGL and raise max amount of threads to 64. Given how unstable this feature is, any value above 1 should be currently treated as a step inside an industrial microwave oven with the on/off switch on the outside. New clipboard implementation allows copying/pasting layers and layer groups. Color tags simplify managing large projects with a lot of layers and layer groups. The Mouse Pointer dialog and colors applied to images are now color-managed. Gamma and precision selectors for newly created images. Never dither when converting to a higher bit depth, or to anything more than 16 bits; don't offer dithering options in these cases. Default to linear TRC when converting to 16-bit float. Pre-initialize some babl-based pixel format conversion routines at start-up to decrease the initial lazy intialization cost for some interactions. Remove max size limitation of 4GB for XCF files. Support clipboard images in the clipboard brush and pattern. libgimp calls are now thread-safe. Layer modes' code is now refactored to separate gamma-corrected variations from the linear light ones, legacy modes have been preserved to support older XCF files. UI to switch between the two is experimental and should be treated as a temporary design. Blending and compositing of layers are configurable separately for more flexibility now, compositing can be linear TRC, perceptual TRC or CIE LAB. Layer blending color space and compositing color space are configurable now. 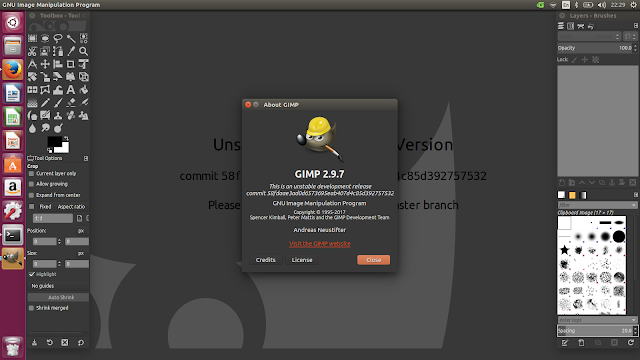 Do I need to remove gimp v2.8 ?